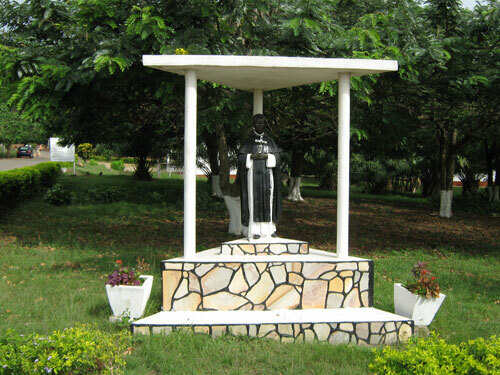 St. Martin De Porres Hospital is located in the Eastern Region part of Ghana under the Lower Manya Krobo and Upper Manya districts it is one of the populous hospital in the region inhabited mainly by peasant farmers and traders of various merchandise whose turnover could hardly cater for their needs due to lack of funds to expand the farms and trading activities. The area, with big towns such as Odumase-krobo, the traditional capital, Agormaya and Asesewa, all big marketing centres, Kpong and Sekesua, like other parts of the region, had no health facility in the colonial period to cater for the people. In view of that, most of the inhabitants had to rely on herbal medicine which although helped a lot, could not be used in the treatment of certain diseases. While the poor and the disadvantaged had no other choice than to rely on herbs, the rich who could afford the cost of orthodox medicine, had to go for treatment at either the Ridge hospital, which was for sometime preserve for the whites (colonialists) and the Korle-bu teaching hospital, all in Accra, a distance of about 65 kilometres. The long distance to be covered led to the death of a number of patients whose life could have been saved if facilities for treatment were available in the community. To make it possible for all to access healthcare without necessarily covering long distances, the Roman Catholic Church which had gained a foothold in the area, decided to put up a health facility at Agomanya in 1946. This facility was established by Rt Revered Joseph Oliver Bowers, one of the priests stationed in the area, started as a maternity home to take care of pregnant women. It was later expanded to a clinic when realized that a number of patients other than those pregnant related cases also reported there for treatment. The situation led to a high patronage of the facility by the sick, not only from the district, but also from neighbouring Asuogyaman, Yilo krobo, Fanteakwa districts, all in the Eastern region as well as Dangbe west in Greater Accra. To make it possible to adequately cater for the medical needs of the people, in April 1997, it was upgraded to a hospital status by the Ministry of Health in recognition of the sterling health care delivery services offered at the facility.